This is a special Collector's Edition early release. The game is scheduled to be released in 2-3 weeks so, the Collector's Edition is for those who can’t wait to escape the Haunted Manor. As a bonus, Collector's Editions purchases counts toward three stamps on your Monthly Game Club Punch Card! 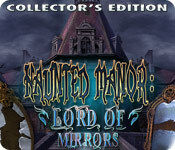 Haunted Manor: Lord of Mirrors Collector's Edition is rated 4.2 out of 5 by 11. Rated 5 out of 5 by Gigglesinthewind from Good game I like this game. I play search games a lot and this is one of the best. Rated 5 out of 5 by neilskinut from I liked it Not a bad game. The HOS and puzzles were not all that hard. Had a decent flow to the game and kept you interested. Hint button works well. Rated 5 out of 5 by desiskorm from Fun game I finished playing the game yesterday. I found it different, fun and enjoyable. Rated 5 out of 5 by Cartman97 from Great Story! Great Game! If you like the eerie feeling you get exploring a haunted house, then this is a great game to play. The graphics are incredible and the music really sets the mood. 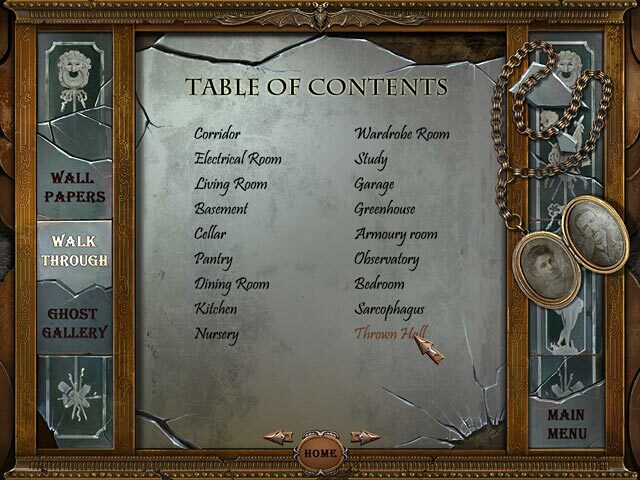 Stay in each room when you first enter to get the feel of it and enjoy playing the HOS, Puzzles, etc... If you are just beginning, this is a great game to start out with. Rated 4 out of 5 by Dr_deNorthewode from It’s All About the Stuff Those Responsible: Top Evidence Studio Game Release: 2010(?) Review: Based on completed game (multiple times) I was surprised to see how many recent, positive reviews there are for this game, most of which are over in the Standard Edition section. It being nearly four years old now, I would think most players would find the game rather out of date – and some do. Indeed, it is a rather simply made game in that there is no live acting or extensive animation or even voice overs. There are no morphing objects; no adorable, cuddly, oh-my-goodness, fluffy animal helpers (thank heavens! ); no features whatsoever – with the possible exception of collectible figurines – that we’ve grown to expect from Collector’s Edition games. So what makes this seemingly unremarkable offering one of my favorite games? Well, the haunting music for one thing, beginning with Mozart’s “Requiem Mass” to, and by no means least, that haunting lullaby-like tune played particularly in the girls’ bedroom. Also, I find the artwork to be original and very well and pleasingly done. But, honestly, what is it really that makes this one of my favorite games? It’s the stuff. I’m always impressed by artists/designers who clearly understand and appreciate the relevancy of the cultural material they place in their games. So often it seems, especially lately, hidden object games are indeed unimaginative junk piles. Games set in the Middle Ages, for example, that include as hidden objects such things as computer components, car parts, and modern utensils – to name just a few. 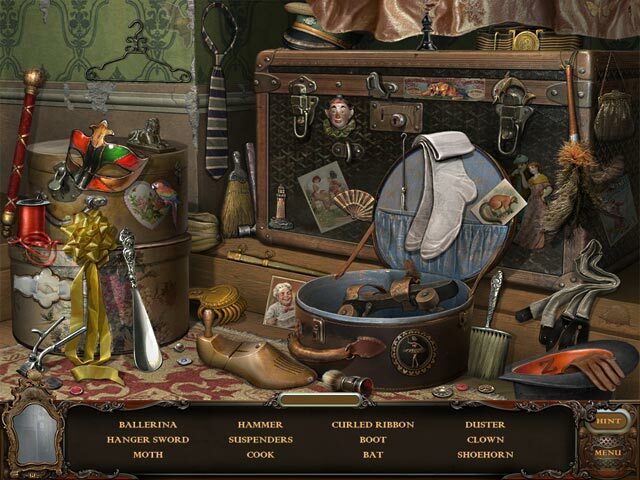 In my opinion, the main enjoyment I get out of playing hidden object games is that I like looking at the stuff. 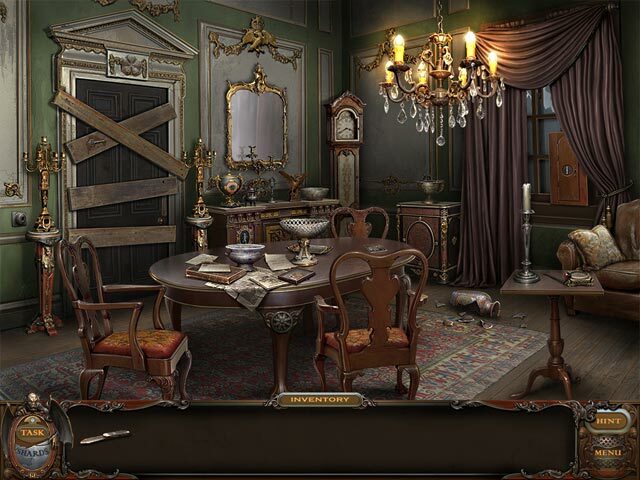 The hidden object challenge in “Haunted Manor” is not particularly high (which a lot of times I also appreciate), but artistically the items are so accurately depicted and relevant to one another that I’ll go back and play the game again largely just to look at the stuff. It’s sort of like pawing through some dusty trunk in the attic of an antique store. How these, I assume, very young game designers even have a feel or a clue for these kinds of items I find very impressive. Perhaps in developing this game they themselves pawed through some dusty trunk in an attic somewhere. Whatever the case, “Haunted Manor: Lord of the Mirrors” is one of my favorite guilty pleasures. If you go into this game expecting too much, then you’re likely to be disappointed. But if, like me, you simply enjoy looking through collections of cool-looking old stuff, then this just might be the game for you too. Oh, and as a parting shot, if you don’t get the Collector’s Edition then you’ll never find out why the main character’s eyes turn forebodingly crimson at the end of the game. Personally I thought it was worth it to buy the Collector’s Edition, but perhaps that’s just me. Rated 4 out of 5 by stubadub from Haunted Mirror for Kindle fire I enjoy BF games on my pc and kindle. The Kindle edition does not include a walkthrough for the bonus chapter, no idea how to unlock the violin case to sooth the Cerberus. I have the violin bow, put the crown on Riddle. Any hints for the kindle edition? Rated 3 out of 5 by Mystic4 from Slow Moving Story I found this game boring because the story was too linear. It was slow and followed a pattern. Enter a room, find and use objects, enter next room, repeat. This is based on playing the demo. Maybe the game gets more exciting but I didn't play further to find out. Rated 3 out of 5 by brindlechewy from Just okay Like Haunted Manor: Queen of Death, this game was visually appealing. The backgrounds were creepy, colorful, and detailed. Unlike Queen of Death, this game lacks a feeling of adventure and exploration. I couldn't finish the one hour trial because it felt like I was being ushered from room to room and checking mundane, simple tasks off of a list rather than exploring the mansion and figuring out where and how to use the items. Rather than being able to explore many different locations at your own discretion, the game just proceeds from one room to the next room--first the hall, then the library, etc-- as you complete simple, self-contained tasks. Part of the fun of hog's is having to travel all over the map, finding and using items in obscure locations. From what I saw of it, this game eliminates that element and the challenge that comes with it. It was pretty, but boring.